The Battlefield 1 spring update is coming soon, bringing platoons and new weapon variants to the game. Battlefield 1's spring update is almost here, and DICE has shown off what's included in a recent livestream. Not only will Platoons return, but there are plenty of new weapon variants, as well as password protected servers. Platoons were first introduced in Battlefield 3, and they are the game's equivalent of clans. Each one has four ranks - General, Colonel, Lieutenant, and Private. When members of your platoon are the majority of members of a squad, the squad name will change to your platoon name. Also, capture point flags will show the emblem of the platoon that contributed the most to its capture. Your platoon will also be usable in Battlefield 4. The new weapon variants include the Hellriegel Defensive, Selbstlader Sniper, Martini-Henry Sniper, and Huot Automatic Optical. Each new variant will be unlocked by completing assignments. Another helpful addition in this update is a Medic revive callout. As a medic, you can spot a downed teammate's body to let them know a revive is coming. This should help keep medics from running to dead teammates only to have them respawn just as help arrives. 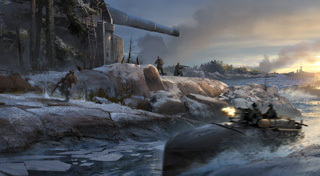 The next patch is also bringing private servers, new ribbons and dog tags, and more. There's no word yet on exactly when it will be released, but it is expected to be very soon. Once the spring update is released, DICE plans to move to a monthly schedule for patches, rather than the current seasonal one.